Scotland’s largest full service stable Arnot Manderson Advocates have again received high praise from the Legal 500 Directory upon the release of their latest Bar rankings. The stable achieved a Tier 1 ranking – the only stable practising in both civil and Criminal law to achieve such a ranking – and was noted as providing ‘an excellent service across a broad range of practice areas’. The Stable’s Family Law Group led by Kate Dowdalls QC fared well and was noted as containing Advocates ‘well regarded for cross-border disputes’. Besides Kate, fellow silk Jonathan Mitchell QC and Junior Frank Burr achieved Tier 1 rankings in Family and Childcare Law. 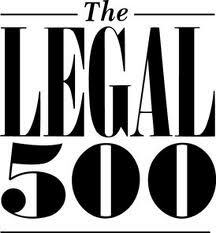 The Stable continues to boast a number of counsel with rankings across various Practice Areas. Besides his Family ranking Jonathan Mitchell QC was also ranked in Civil Liberties and Commercial Litigation. Frank Burr was also ranked in the Property category alongside Hugh Olson who was achieved further rankings in the Civil Liberties section and the Personal Injuries, Medical and Professional Negligence category. Joining Hugh with a Tier 1 ranking in the PI, Med. and Prof Neg. category are Stable Director Gerry Hanretty QC, Andrew Young QC, Neil Mackenzie and Gordon Balfour. Gordon also features in another area of strength for the stable namely Commercial Litigation where Gordon and Jonathan Mitchell are joined by Andrew Stewart QC, Laurence Murphy QC and Iain Mitchell QC. Iain Mitchell QC was also commended in Intellectual Property, Information Technology and Media as was Duncan Hamilton who was noted as being ‘Experienced in high-profile defamation cases’. In addition Colin MacAulay QC has been ranked the Health and Safety and Regulatory field and was said to have ‘considerable experience in cases involving the crossover between health and safety and criminal law’.